I was introduced to stinging nettle about a year ago via my favorite food podcast, Last Chance Foods. I was instantly sold on this green that folks claim cure seasonal allergies. Being that I’m allergic to just about everything, I quickly went on a mad hunt to find this magical wild plant, but I didn’t have much luck. It’s now a year later and as I was walking through the farmers market today, I finally spotted it. I grabbed a big bunch and headed home to make some nettle soup. Saute leeks in vegan butter (or oil of your choice) until soft – about 10 minutes. Add water (enough to cover potatoes once you add them) and bring to boil. Add in potatoes, a few good pinches of salt, garlic and shallot and let cook until potatoes are soft – about 15-20 minutes. Add the nettles and let cook until wilted – about 5 minutes (make sure nettles are completely submerged in water). Strain and discard the water. 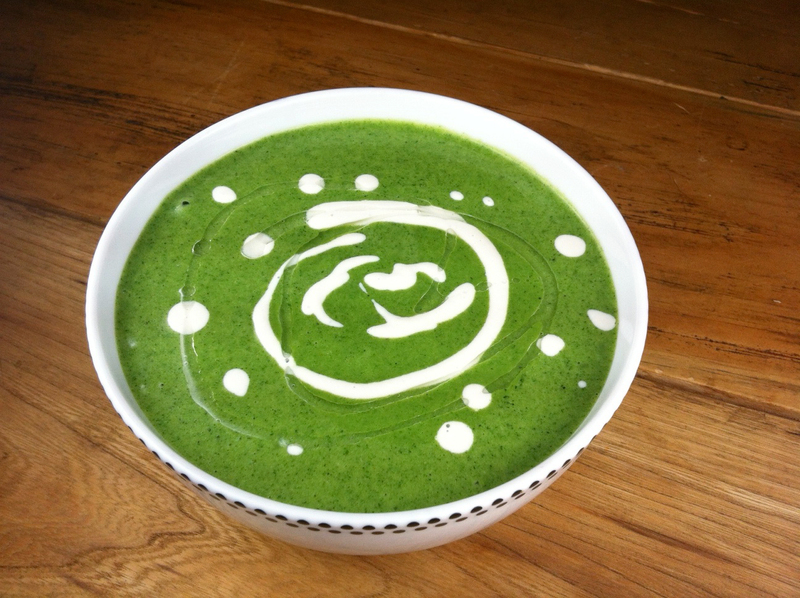 Add all ingredients to blender with vegetable broth and sorrel. Blend until smooth, adding more vegetable broth as needed. Season with salt and pepper. If you prefer a creamier taste, add a bit of cream or cashew cream. Top with truffle oil if desired and serve. This entry was posted in Recipes and tagged garlic, leeks, potatoes, Shallots, sorrel, stinging nettle.